POWERFUL CAPABILITIES. PRECISION YOU CAN FEEL. Basher, racer – it doesn’t matter. The DX6R is a no-compromise, smart radio that has everything expert drivers could want and a few things they'll wonder how they ever lived without. Best of all, you don't have to be an expert to use it. 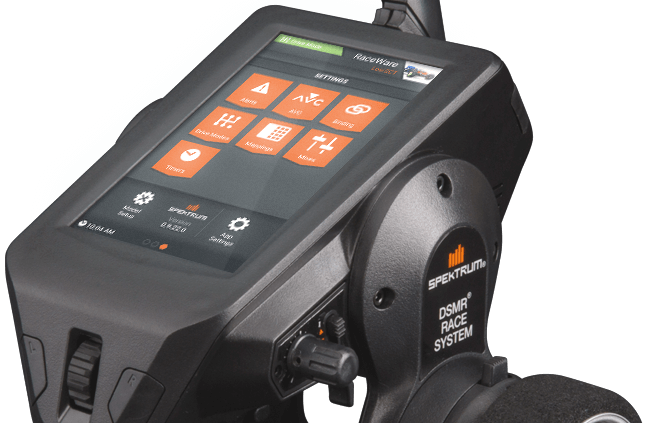 You literally 'tap' into the DX6R's programming features using its Android-powered, touch-screen interface. The big color display makes navigating menus and adjusting settings as easy as it gets. If you're out driving with another DX6R owner, you can quickly and easily swap model setups via Bluetooth. No WiFi or SD card transfer necessary. Just link up and swap. Optimized weight distribution and an abundance of adjustable features make it easy to customize the DX6R's ergonomics to your driving style. 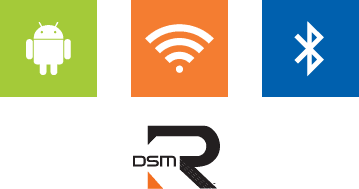 You will enjoy a sense of balance and comfort that perfectly complements the precision of DSMR technology, especially during long racing heats. When matched with a receiver capable of 5.5ms frame rates, the DX6R delivers lightning-fast response that gives new meaning to the word 'connected'. The enormous capacity of the DX6R's on-board memory means you will rarely, if ever, need to juggle models between transmitter memory and your SD card. You can take advantage of all six channels and telemetry functions with the included SR6000T. A tiny SR2000 Race Receiver capable of a 5.5-millisecond frame rate is also included. Keep tabs on important information without ever taking your eyes off what you're driving. With the programmable voice alert system, you can have the DX6R call out lap times or report telemetry information. If an alarm goes off, you won't have to look at the display to see what's happening. The DX6R will tell you. In addition to a built-in speaker, the DX6R has a headphone jack that allows you to monitor voice alerts using earbuds so you don't bother other drivers. You don't have to remove the battery or plug in the transmitter when it comes time to recharge. The DX6R includes a handy charging base that doubles as a transmitter holder. Its compact footprint won't clutter up your pit station or workbench either.